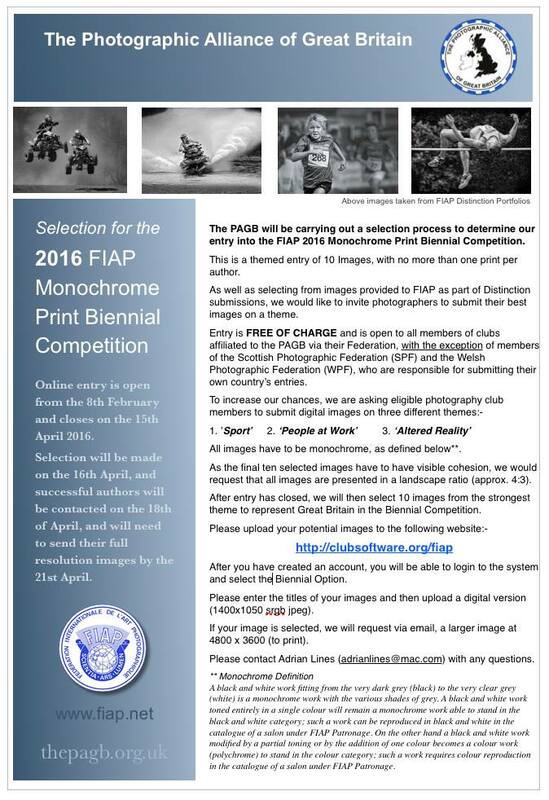 Selection for the 2016 FIAP Monochrome Print Biennial Competition Online entry is open from the 8th February and closes on the 15th April 2016. Selection will be made on the 16th April, and successful authors will be contacted on the 18th of April, and will need to send their full resolution images by the 21st April. Entry is FREE OF CHARGE and is open to all members of clubs affiliated to the PAGB via their Federation, with the exception of me of the Scottish Photographic Federation (SPF) and the Welsh Photographic Federation (WPF), who are responsible for submitting their own country’s entries. For further details, please click on the image top-left.